Richard loves to cook. Every Sunday night (even if we’ve got back to Auckland from the farm an hour before midnight) he’s plundering the freezer, thumbing through recipe books and notes, deciding what to cook for the week. Cooking is an experiment, something to relentlessly improve on, to satisfy creative itches and his greedy, daily diner. My workmates like to gently taunt me with my ‘leftovers lunchbox’ every day, as it’s always much better than their ho-hum sandwiches or packet tuna and rice. I’m more than grateful. Sometime during winter, when the bees were ‘sleeping’ (as I call it), Richard had an idea to grow garlic. And not just any garlic, but garlic that’s been grown organically, from heritage New Zealand stock. This was met with much praise by Dad, who’s been eating garlic with his breakfast for years, for his health. The promise of a shed full of garlic that hadn’t been bleached, or shipped thousands of kilometres around the world, was enough to transition a paddock for cows into garlic beds. 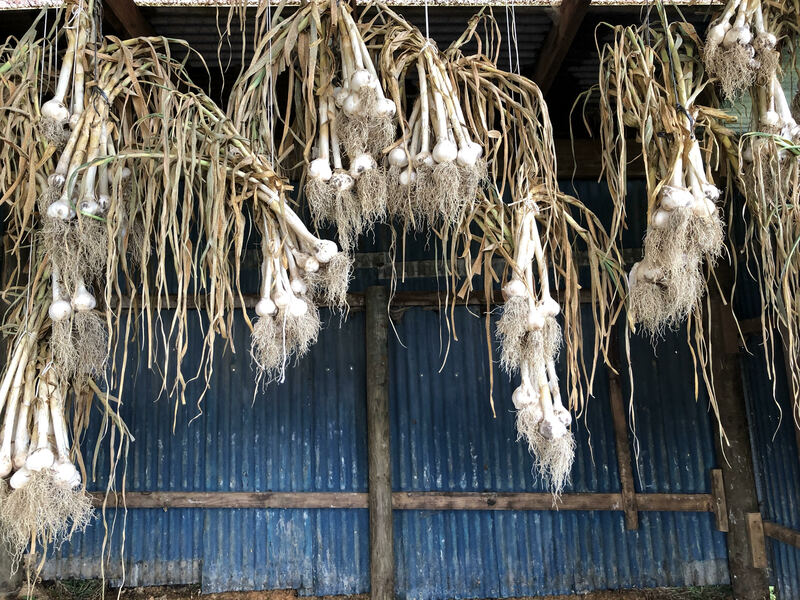 We knew nothing about growing garlic, but, as with the bees, we read every book we could get our hands on and fired around a bunch of YouTube and blog links. The medicinal claims were impressive. It seems that ancient Chinese and Indian medicine recommended garlic to aid respiration and digestion, and Olympians in ancient Greece took it to increase their stamina. Clinical investigations today suggest it helps reduce cardiovascular and other diseases, and has an antimicrobial effect*. But which variety to grow? 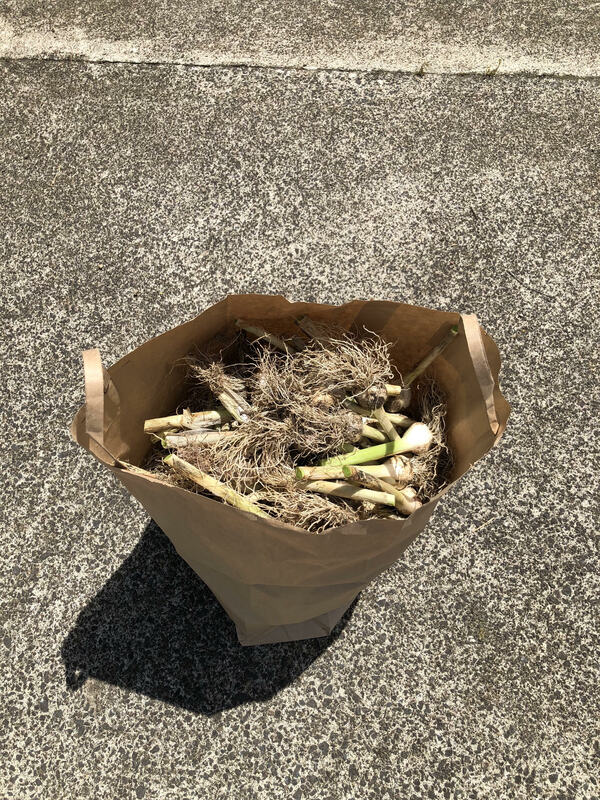 We ended up with Takahue Red, a heritage New Zealand variety that’s great for cooking and remedial purposes, with fat red or pink-skinned cloves. It’s presumed to be an old Dalmatian variety, and our bulbs were from a grower who had purchased from heritage food plant collectors, the Koanga Institute in Wairoa. The biggest rule of thumb, we learned, was to plant on the shortest day of the year and harvest on the longest day. We began by taking the dried bulbs and pulling them apart into individual cloves. Richard hates cooking with small cloves, so we sifted through and found the biggest ones, as these would presumably become big bulbs of garlic. To prepare the beds, we used a cultivator to hoe up the pasture. Next, we got a string line and wound it around electric fence standards to form ‘lanes’. Two weeks after the shortest day, over a weekend, we planted two beds of garlic. We planted the cloves with the pointy end up, 15 cm apart and about 5 cm deep in the ground. A month later, we put out two more beds. 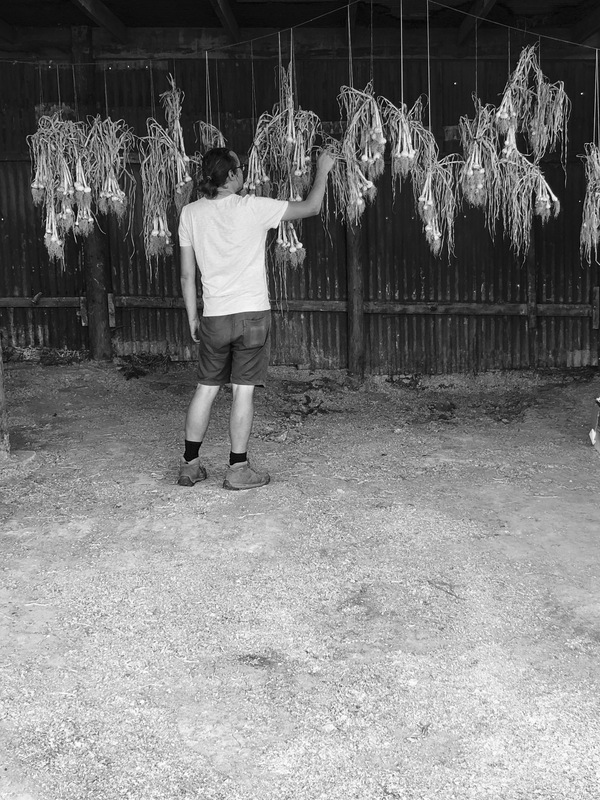 Garlic needs to be rotated every year, so we chose the forest garden area in front of the cowshed. This has given us time to establish a more permanent market garden area (and for Dad to follow through on his promise to give up the grazing paddock). Over the course of the season, weeds, in particular dock, were a problem. Our not being at the farm every weekend meant these grew tall. Planting the rows further apart next time will allow us to mow, or use a cultivator to get rid of the weeds. This year, too, all garlic growers had problems with garlic rust. It doesn’t affect the bulbs, but makes the leaves turn spotty and, as the name suggests, rusty-looking. We think allowing more room for the garlic and using a compost tea in the early months will help with this. A couple of days after the excesses of Christmas Day, we harvested the first two beds. We used a fork to loosen the soil, pulled each plant out and dried the plants in the sun for a day. 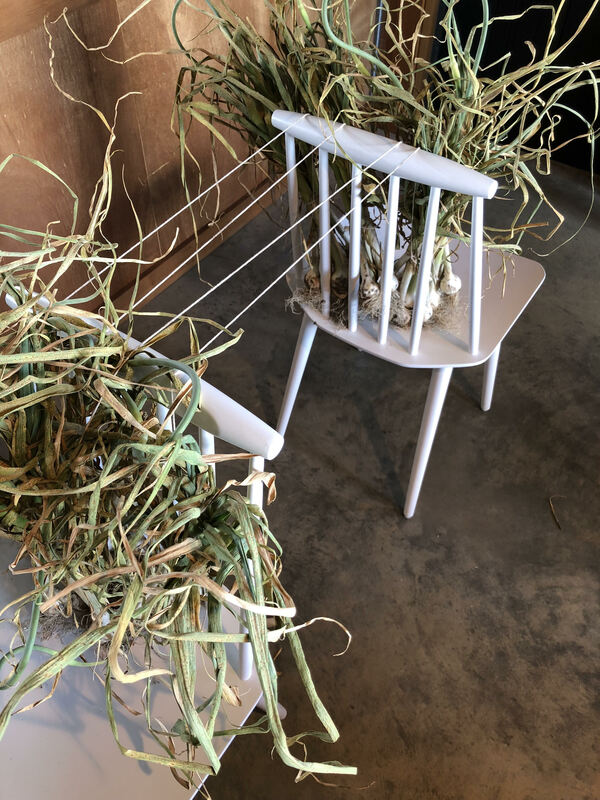 We then tied bunches of five up with twine, hung them in a shed that has lots of air flow, and left them to cure over summer. Three weeks later, we gathered up the remaining bulbs. It’s said that garlic grown in cooler areas has both better production and flavour. From the bulbs we’ve tasted so far, the Waipa climate seems to be welcoming to garlic growing. Aside from using the garlic in Dad’s breakfast and Richard’s dinners, we’re going to use the garlic we’ve grown to plant more beds this May. Beginning earlier in the season will, we think, yield even bigger and healthier bulbs, and they’ll be on sale late the following summer. At the weekend, we drove down to Rotorua and picked up a smoker. Richard’s got a plan to experiment with what happens when garlic meets heat. The diner is very excited about this prospect.